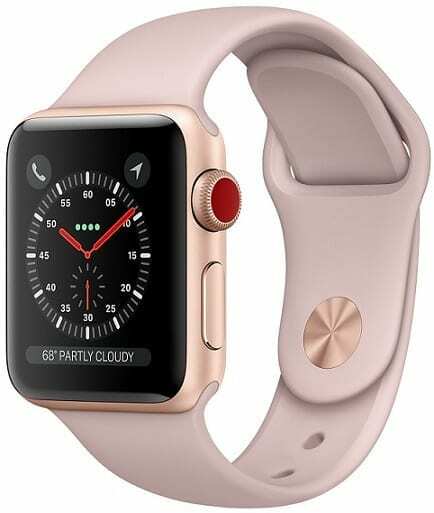 Apple Watch Series 3 is a third generation range of smartwatches by Apple and arguably the one to beat on the market. With this wearable, you supposedly can afford to leave your mobile phone at home with optional support for 4G LTE connectivity. Apple Watch Series 3 is a smartwatch you can mix and match with your outfits. It parades a fully customisable design and offers a variety of faces. You will be spoiled for choice when it comes to the available options; your budget will determine the perfect fit, though. The Apple Watch Series 3 comes in a variety of finishes, including gold, silver and grey. Its body is built on aluminium or stainless steel with ceramic back. There are also more expensive, special edition models featuring ceramic in their design. As you’d expect, the watch is water-resistant and can survive up to a depth of 50 meters. You can get the wearable in 38mm and 42mm sizes. The OLED display still has a resolution of either 272 x 340 pixels or 312 x 390 pixels. This boasts double the brightness of Apple Watch Series 1 at 1,000 nits. The touchscreen features ‘Ion-X strengthened glass,’ which means this one won’t break easily. Apple Watch Series 3 still supports Force Touch tech. The Apple Watch Series 3 comes with the new S3 processor and W2 chip. Apple says the dual-core processor runs up to 70 percent faster. In its own case, the W2 chip helps the smartwatch deliver up to 85 percent faster Wi-Fi and Bluetooth connections. The American company also runs its new wearable on its latest watchOS 4 software. This provides users with a variety of features, including Toy Story watch faces and improved, full-function Siri personal assistant. Apple Watch Series 3 also promises better music and workout experiences. Apple makes its Watch Series 3 available in both LTE and no-LTE models. It embedded an eSIM into the wearable. With LTE, you can enjoy thrilling Apple Music streaming. The device allows you to make and receive calls, including video calls. You can also send and receive text messages. The Apple Watch Series 3 comes with 8GB or 16GB onboard storage, depending on model. Apple rates battery runtime at up to 18 hours. Apple Watch Series 3 was launched on September 22, 2017. The 38mm model will go for $399 with LTE and for $329 without. We currently have no information on pricing and availability in Nigeria. Apple Watch Series 3 price in Nigeria is expected to range from 125,000 Naira to 175,000 Naira.